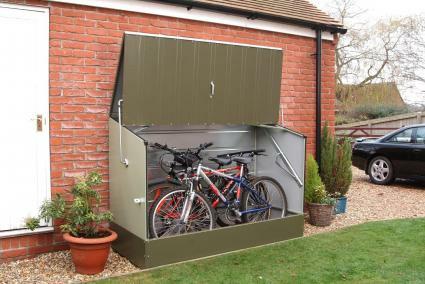 Bicycle storage is important since you want your bike accessible, dry and secure. Garages have ample room but bikes can get buried behind other items making accessibility difficult, so providing a separate home for your bi-pedaled friend might be your best option. You paid a lot of money for that bike, so why not spend a little to protect it as well? Depending on your living space and location, there are many options you may want to consider but be aware, some assembly is required. 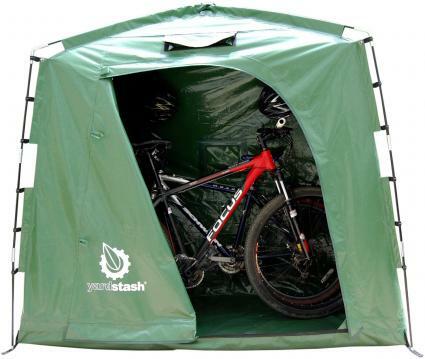 For less than $200, YardStash has a two-bike tent-style storage shed perfect for the renter who needs portable outdoor storage in a secure area. Unfortunately, this small tent will not keep your bikes vertical by itself and strong winds can blow them over. A tougher version of its well-received predecessor and new for 2016, the Yardstash IV was found easy to assemble, according to one Amazon customer, and a great price for buyers looking to make their rides more accessible. Heavy duty weatherproof, tear proof, UV proof vinyl has water and snow shedding roof design for all season protection. Rubber tabbed zippers with storm flaps protect against water, dust, and pests while the front meshed vent prevents condensation. It has a 74" wide x 32" deep x 68" high space saving footprint with integrated floor that totally encloses bikes and equipment from elements. For a more secure bicycle option, bike lockers are small structures anchored to the ground with bolts, much like a vault, and are usually made from steel or plastic. Unfortunately they are expensive, over $2,000 each, and are usually sold to parks and recreational centers for rentals. The Trimetals bicycle storage unit on the other hand can hold up to 3 bikes and costs several hundreds of dollars less. Some consumers have found the A300 design difficult to assemble but are usually pleased with the finished result. Guaranteed against corrosion for 25 years on the PVC coated, fire resistant, galvanized steel. Two padlock position enclosure with spring assisted lid for easy access. Low profile creates a welcome addition to your backyard and accommodates most HOA guidelines. For a low profile, easily accessible option under $500, Suncast's Glidetop shed has dual doors and a sliding roof to make access easy and secure. The sturdy construction and quick assembly provide extra room for more than just bikes and the short profile meets most home owner association guidelines. Walmart purchasers rave about the simplicity of this product assembly, especially the storage space available afterwards. Double wall resin structure assembles quickly using Easy Bolt securing system. 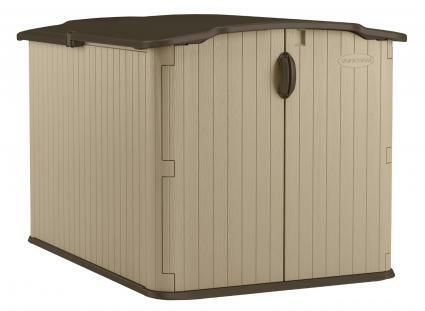 Large 98 cubic foot capacity with reinforced floor in a small lightweight design. Sliding lid with three door locking system protects valuables. 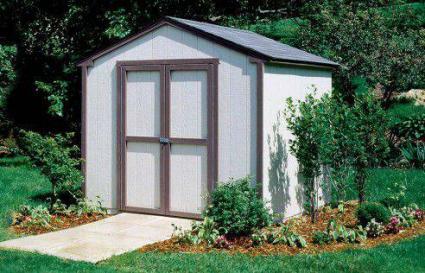 For a more affordable large shed option, Arrow's 10x8 foot steel shed is a great deal for under $300. The six-foot peek height makes entry easy and the roomy interior and double door design can house many large yard implements as well as bikes. Floor covering is not included and some customers found the floor frame a bit flimsy and built block or wood bases before assembly. Everyone who purchased from Lowe's seemed mostly pleased with the price and the finished product stability. Galvanized steel withstands rot and extreme weather and includes a large 54 inch double door. 74 square foot floor frame provided for shed stability and large item support. Pre-drilled and pre-cut parts for easy installation and the unit comes with a 12 year limited warranty. For a more attractive option, a solar style shed will provide ample light for your shed space while increasing curb appeal. Phoenix provides a six-foot eave wall and 509 cubic feet of storage in their almost $2,000 design, providing a roomy home for your bicycle and yard needs, but that price doesn't include shingles. Reviewers at Home Depot who purchased this item found it helpful to hire a handyman to assist them since some elements arrived warped, but many were pleased with the finished results. SmartSide engineered wood resists fungal and pest intrusion while preventing sagging and denting. Floors, vents and tempered glass are included in the design and the 9-foot roof peak provides ample head room. Door can be installed on the eave or gable side and you're protected by a 10-year limited guarantee. For the rugged customizable option, a paintable cedar lean-to provides an aromatic and attractive area to store your bikes and equipment. 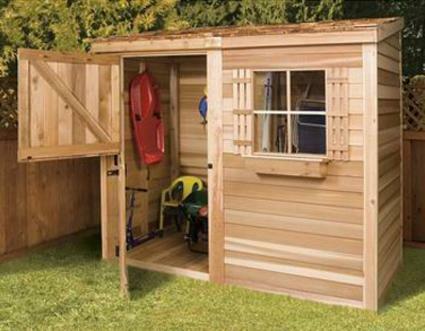 Cedarshed's bayside kits include many customizable lean-to options to choose from for under $1,800 and come with pre-built wood panels for ease of assembly, but you will have to seal the wood afterwards. CedarShed's animated videos help you realize the simplicity of the shed's assembly and their customer testimonials tell how the products can adapt to just about any environment. 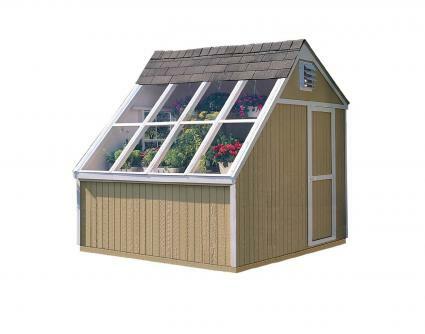 No cutting involved and kit includes all hardware, instructions, and pre-shingled roof panels for ease of assembly. Basic western red cedar finish kit includes cedar dutch door, a fixed window, and is available in four designs: 6'x3', 8'x3', 8'x4', and 12'x4'. For a fee, you can also customize their user-friendly design with more or functional windows, and a larger or sliding door. 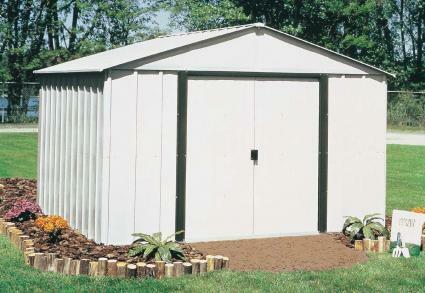 Starting at around $1,300, Backyard Buildings will deliver and build your shed for one low price! Their network of local professionals will not only install your shed but you will then have a reliable contact who may be able to help you with future household needs. You will need to secure any building or HOA permits prior to your shed's arrival and installation, so be aware of those stipulations. Customers couldn't be more enthusiastic about the quality and professionalism of the contracted installers who arrived on site. Delivery and installation in one set fee. There are some who cringe at the sight of these three letters, DIY, but since the age of the internet there is nothing that can't be found online. Hundreds of sites contain free videos, designs, blueprints, and tutorials of how to build your own storage sheds out of just about anything, including pallets. Many things including bicycle sheds can be found on Instructables.com. There, regular people show and tell their proud creations for you to replicate yourself. 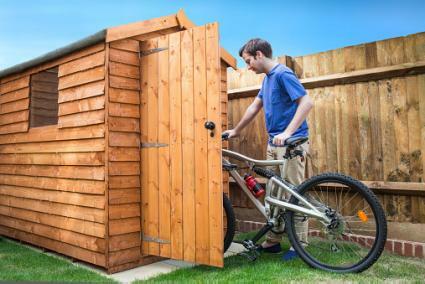 But, if you don't find the shed you're looking for, you can always combine one or two ideas to make the perfect fit for your bicycle needs. Why Not Just Put Your Bike Outside? Probably the worst way to store a bike is to keep it outside! Not only does it get damp from dew before your morning ride but outside elements will deteriorate your tires, chain, bearings and brakes, increasing maintenance costs and decreasing the life of your ride. Small lean-tos and open enclosures add little protection against these powers of destruction as well, so you will want to think about a weatherproof enclosure to protect your cardiovascular investment. Pick one of the options above to fit your needs and lifestyle.